Are you tired of experiencing the water sports activities alone and you are looking for some activity that can be enjoyed with the family? Then we have got a right sport for you that you can enjoy with your family and make your trip to Goa a memorable. 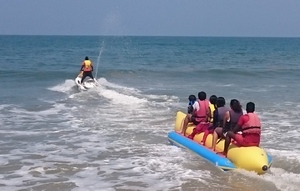 Banana ride in Goa, It is one of the most popular water sport for the tourists and the local people in Goa.